Join us for the launch of Love Grays – the launch of a year of events in Grays, ranging from a food festival, outdoor cinema screening, art trail and lots more. The launch event on the 25 Feb is celebrating the town centre and the brilliant community and cultural organisations and the work they do. As part of the event we are hosting a large stage on the high street, where local groups will be performing, and highlighting their fantastic work. There will be dance demonstrations, twitter workshops, choirs, bands and performances. 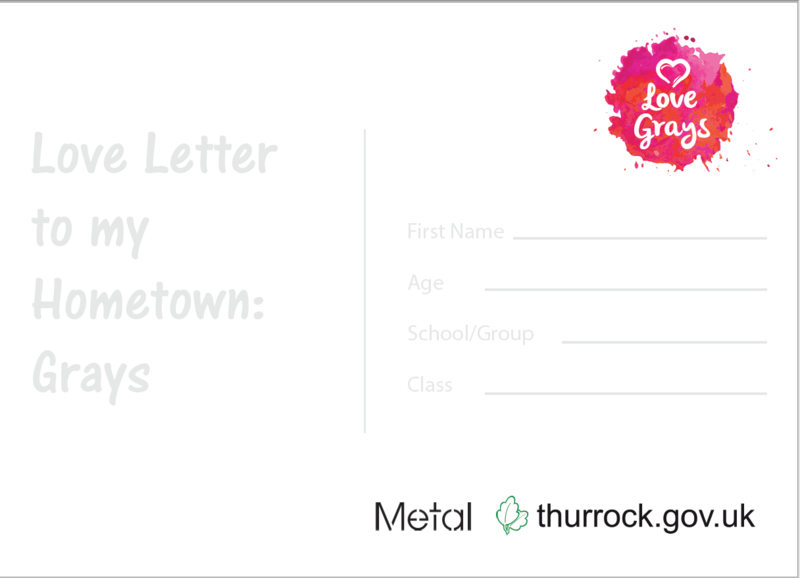 There is also a big schools/community project called ‘Love Letter to my Hometown: Grays’ – we are sending out hundreds of blank postcards for people to write/draw/collage/paint a love letter to Grays. Completed cards will form an huge exhibition on the high street on the 25th, where you will be able to collect a free tote bag celebrating the launch. There will also be ‘creative stations’ where you can add your own to card to the exhibition, including rap/poetry workshops, screen printing, drawing and digital responses. If you would like to be involved email clare@metalculture.com or pick up a postcard from Grays Library.